Albert Einstein. The genius who invented e=mc2. Possibly the brainiest scientist in history – and the battiest! But did you know that Al’s life was almost as wild as his hair? Not only was an unruly young Al expelled from school, but he was spied on by the Nazis and the FBI. And after he died, he had his brain removed! Yes, even though he’s dead, Al’s still full of surprises! Dr Mike Goldsmith is a qualified astro-physicist, working at the National Physical Laboratory. 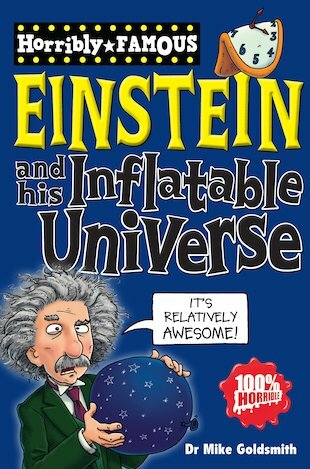 His book on Einstein in the Dead Famous series was shortlisted for the 2002 Aventis junior prize for science writing and he has written Scientists and Inventors in the same series. Philip Reeve is the award-winning and critically acclaimed author of the Mortal Engines books. Philip has won many major awards, including the Nestle Smarties and Blue Peter prizes for Mortal Engines, the Guardian prize for A Darkling Plain and the Carnegie medal for Here Lies Arthur.